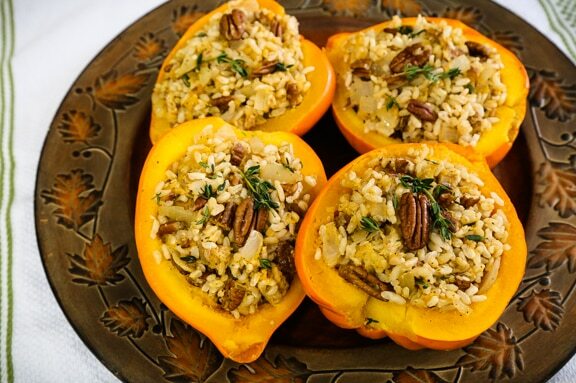 Brown rice and pecans are a tasty team in this thyme-scented stuffed squash recipe. 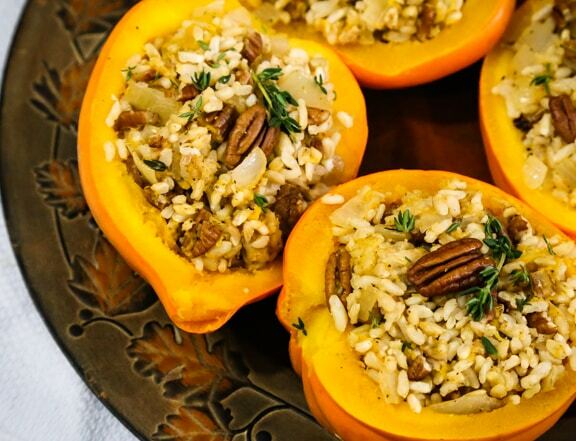 The savory nut, bread, and rice stuffing, contrasted with the subtle sweetness of the acorn squash, makes a perfect holiday main or side dish for Thanksgiving or Christmas, though you can enjoy it as a weekend meal any time throughout the fall and winter. Photos by Evan Atlas. 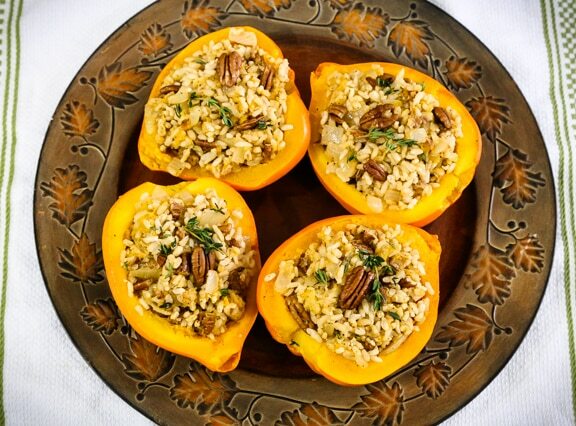 Brown rice and pecans are a tasty team in this thyme-scented stuffed squash recipe. Wrap the squashes whole in foil. Place in a casserole dish, and bake until you can pierce through with a small knife or skewer, 30 to 45 minutes (this will vary greatly according to the size and variety of the squashes). Check every 5 minutes once you pass the 30 minute mark; the squashes should be done but still firm. While the squashes are baking, heat the oil in a large skillet. Add the onion and sauté until translucent. Add the celery and continue to sauté until the onion is golden brown. Add the torn bread, cooked rice, and half of the pecans to the skillet and sir together. Stir in the orange juice, seasoning blend, and thyme leaves. Season with salt and pepper. When the squash is done and cool enough to handle, cut each in half lengthwise. Discard the seeds and fibrous part of the pulp. Scoop out enough remaining pulp to leave a sturdy 1/4- to ½-inch shell all around. Chop the pulp (there really won't be that much), add it to the rice mixture, and stir together. Stuff the skillet mixture into the squashes. Sprinkle evenly with the remaining pecans, with additional thyme leaves. Finally, garnish each squash half with a sprig of thyme. Just before serving, return to the oven for 15 minutes or so, or until nice and hot. Here are more of VegKitchen’s Vegan Thanksgiving Recipes. Explore our recipes for vegan Christmas dinner.